What is one element of business that every boss cares about? Money. Specifically, Return on Investment (ROI). If you plan to convince your boss that Conversion Rate Optimization (CRO) is the way to go, then you need to prove that optimizing your website, app, ads or whatever else is going to make the company money. Don’t think of this challenge as how am I going to sell CRO to my boss. Think of it as I’m going to show my boss this awesome thing that’s going to improve sales for the company. 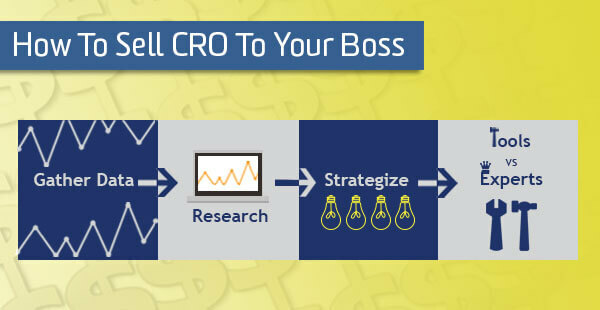 In order to convince your boss that CRO will improve the company’s bottom line, you first have to show them how. Data is the best way to go about it. Don’t forget to show your boss how much money the company is losing by not optimizing! You can use these optimization stats to help you out. When management hears that Obama raised an extra $60 million for a fundraiser during his candidacy and all his optimization team did was test the CTA button and the media banner, they’ll get a nudge in the right direction. Get a few reports of your company’s web/app/digital ad data and set up a meeting with your analytics team to determine where improvements can be made. Check website pages with a high bounce rate, low conversion rate and low time on page. Then, review those pages to discover why people are leaving, why they aren’t converting, etc. Is the page layout awkward? Is it hard to find what they might be looking for? Make a list if the problems and the opportunities. Now, you need a plan. It doesn’t have to be a 30 page document, but know where you want to start and about how long it make take to optimize your pre-selected areas. Tip: Make sure to emphasize quick wins. Start with something like A/B testing for CTAs, imagery or maybe paragraph phrasing. These tests are easier to implement than others and can show improvements in conversions and pages/session quickly. In your plan, you should also provide the metrics you’re going to use to define success. These metrics will be different depending on your goals. Maybe you want to sell more products and you plan to change your CTA button in your A/B testing. If so, then your metrics would be clicks and conversions. Did you get more clicks than usual and did that lead to conversions or an abandoned cart? You get the point. The faster you can prove the ROI of the CRO testing, the more convinced your boss will be. If he/she is on board, they’re going to want to know how all of these ideas can become reality. You have two options: you either need to figure out how to use optimization tools or find a professional to help you optimize. How much time do you have to make this happen? Is that time best spent learning to optimize, or talking about a contract with a professional? Read about both and pitch the ideas to your boss. 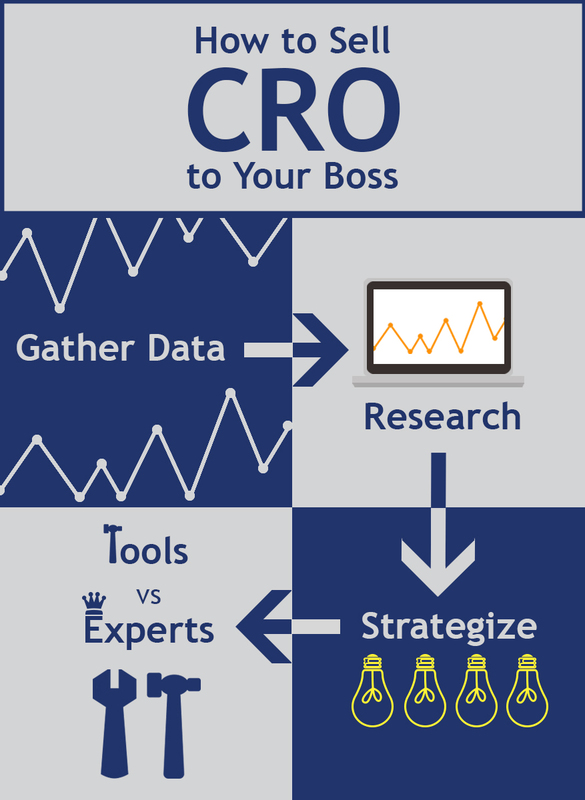 Have you ever had to convince your boss to invest in CRO? Which tactics did you use and did it work? We would love to hear about it.